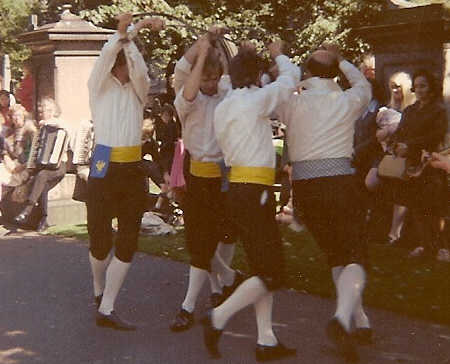 Richard Stapledon remembers his earliest days of dancing Rapper on the Wirral, home of the Mersey Morris Men, and traces its history to today. In charge of folk dance development throughout the North West and particularly Mersey and Deeside area, was a full time staff member of the English Folk Dance and Song Society, Miss Ethyl Anderson. By necessity, she was highly proficient in all forms of social and ritual British traditional folk dance and she would have passed the various exam standards of that era run by EFDSS. She regularly attended all the folk dance groups, helping in many ways as well as organising dance festivals and courses such as the regular annual week-long courses at Burton Manor on the Wirral. These would be attended by people from all over the country and beyond but the majority would be local to the North West. Ethyl would gather a team of highly experienced staff for the week, making sure that there was sufficient expertise for teaching and playing. 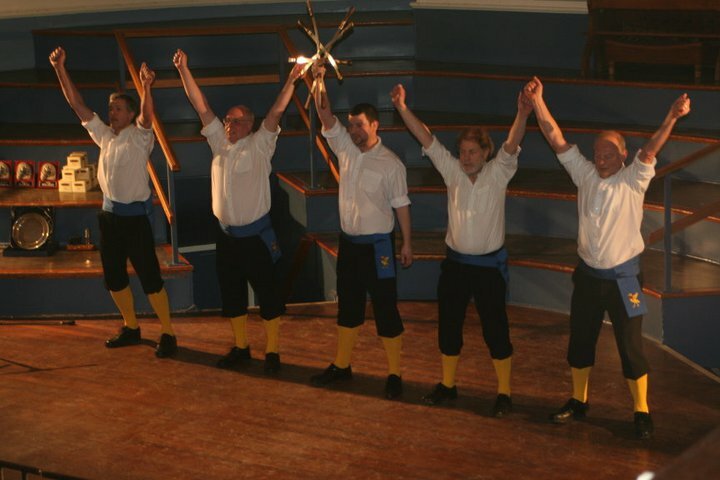 Activities would include: social dance (mainly ‘Playford’ style); Morris; Rapper; Longsword and folk song. 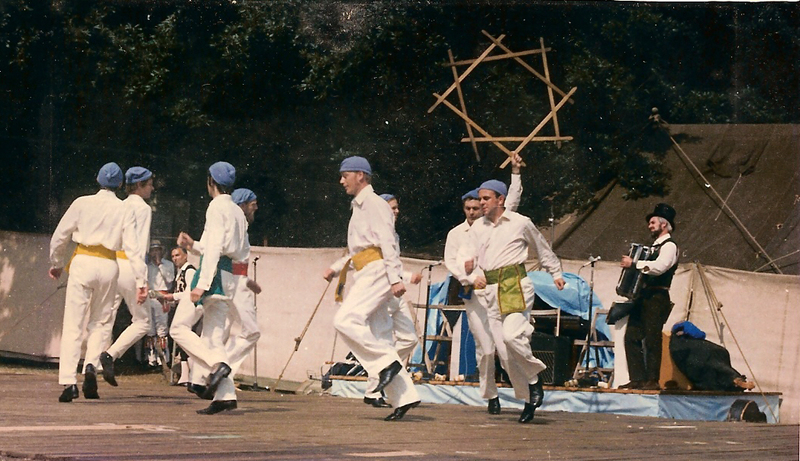 Many of those who attended would be members of folk dance clubs and Morris sides and the skills and expertise that were absorbed would be taken back to the clubs/sides and passed on. Parkgate, 1965. A Rapper team from Burton Manor performing outside the Old Quay, Parkgate, (still a regular venue for MMM) Peter Oakley (from ‘down south’), Richard Stapledon (MMM), Harry Lockey (Stockton), Ted Armishaw. 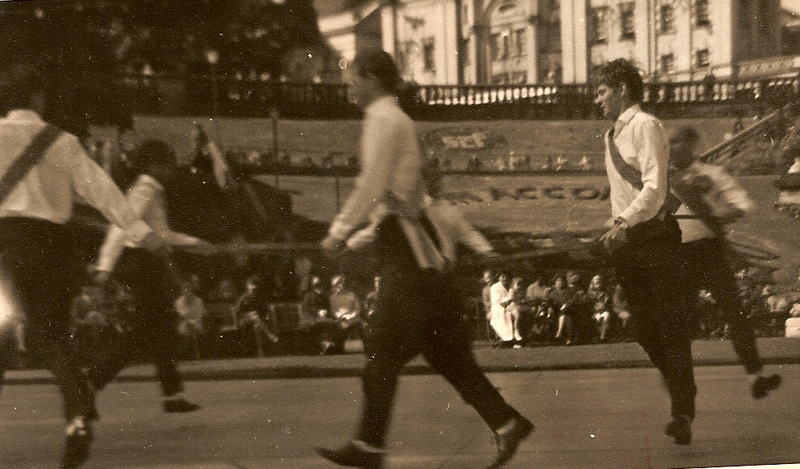 There would also have been displays of folk dance and Morris. Although the sessions at the Manor would have been for all comers, Ethyl Anderson would not even consider the idea of women dancing the Morris or Rapper in public! Some members of MMM would also have been selected to take part in Ethyl Anderson’s dance demonstration team that performed at shows and festivals both locally and nationally. 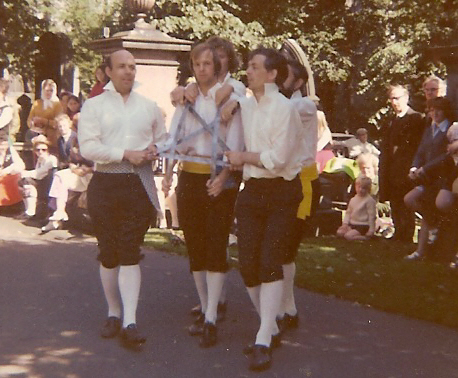 A team visited Aberdeen in 1969 and 1972 to put on folk shows in the city during week-long festivals. 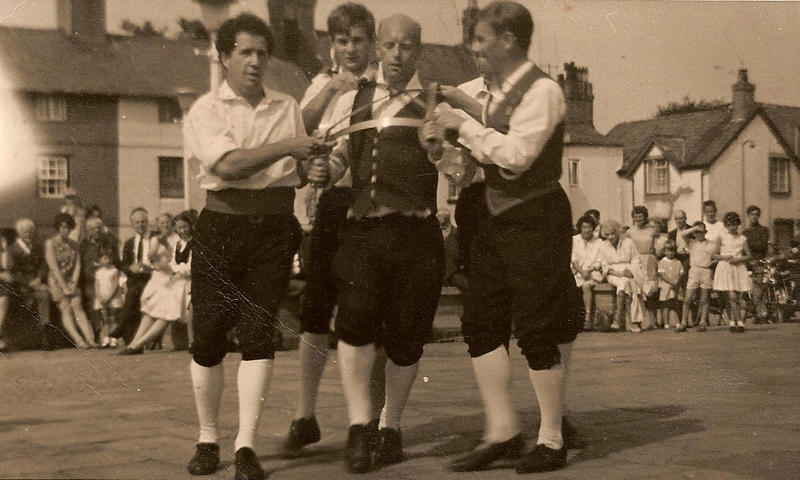 A team also took part in the Sidmouth International Folk Festival in 1971. Besides various styles of social folk dance, Morris, Rapper and other forms of sword dance were performed. Aberdeen, 1969. 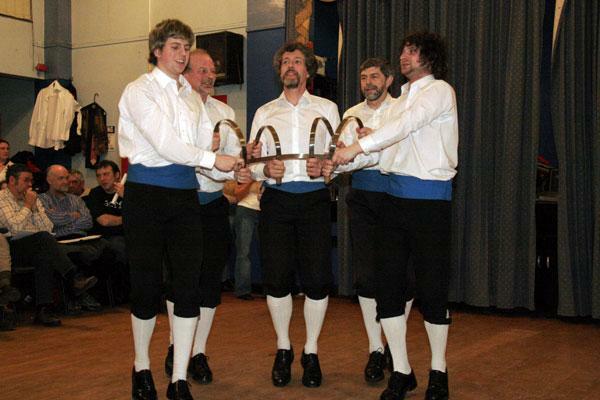 Papa Stour Sword Dance, Richard Stapledon (2nd from right), David Anderton (lead dancer and St. Helens MM) far right. MMM were giving public Rapper performances by this time. The following photo shows the Liver bird on sashes worn by members of MMM in the Rapper demonstration team at Aberdeen in 1972. Fiddle accompaniment was provided by Joy and Henry Larsen. Music was also provided by Dennis Smith (accordion) who played regularly at Burton Manor and was the highly acclaimed, longstanding musician for Westminster Morris Men. He is in the following photo, seated on the left, next to Ethyl Anderson. As above showing the MMM Liver bird on the sash, Ethyl and Dennis. Rapper was included in two major events that MMM took part in over the next few years. The first of these was the Whitby Folk Festival in 1975. Unfortunately, we have no photos of the festival and none exist in the official MMM scrapbooks. 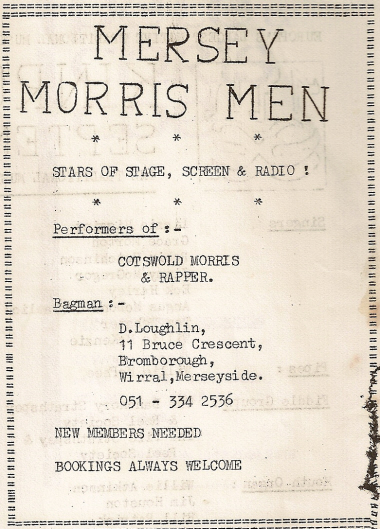 However, the following advert was placed during the week in the ‘Whitby Folknews’, on 19th August 1975 showing that MMM would be performing Rapper. 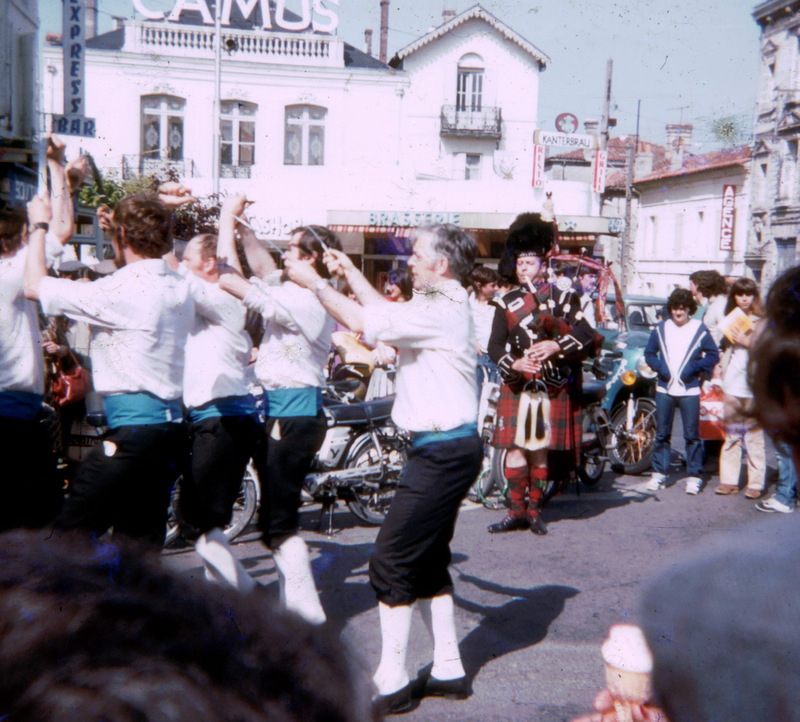 The second event was the visit of the side to Cognac in 1979 to take part in a festival. This was the first ever trip abroad for MMM. The one photo we have, below, shows a performance to the music of a bagpiper! Rapper activity in the side became rare after this and eventually dwindled out completely from MMM’s repertoire, especially after the retirement from the side of Charlie Williams who was the most experienced and a Rapper enthusiast. In the 1990s interest was resumed so a few practice sessions began. This was certainly a ‘back to square one’ situation as Richard was the only dancer with Rapper experience. However, soon after this, the side was fortunate to welcome a new member, John Nuttall, who had considerable Rapper experience from his university days at Leeds with Sadler Rapper in the early 1970s. 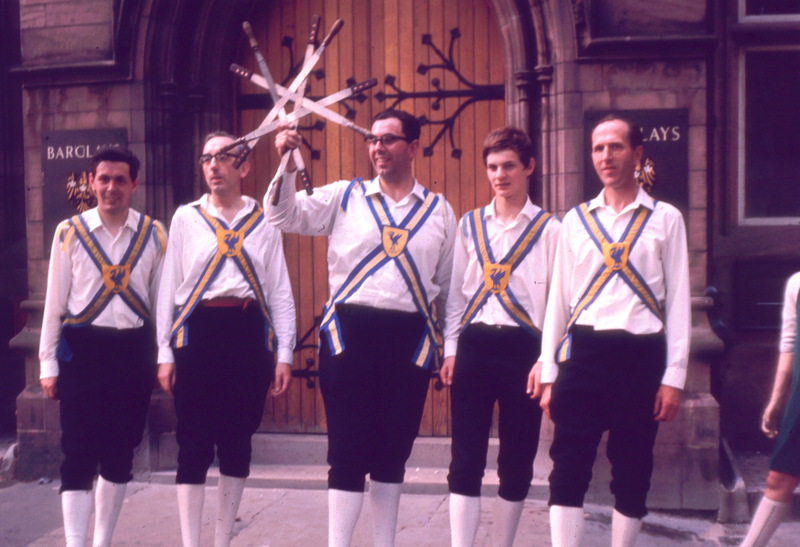 John was soon recruited to be the side’s Captain of Sword and Rapper became an important part of the Mersey repertoire, second only to Cotswold Morris. The side’s Rapper team was brought up to competition standard and has taken part in DERT (Dancing England Rapper Tournament) on three occasions, being bronze medal winners in the Open Class on their first appearance in 2002 at Sheffield and being Best Morris Team Performing Rapper at Oxford in 2011. More recently MMM Rapper has been performing under the name of ‘Scally Rapper’. The name seemed appropriate since the side’s home is near Liverpool and it suggests team members are young, vigorous and slightly mischievous (which for MMM is somewhat ironic). Scally’s basic dance is made-up using well-know figures and in part assisted by Stone Monkey when MMM attended one of their workshops in the late 1990s. The basic idea is to show off the different types of moves – circles, lines and interweave – and tailoring the figures to give the impression that the dance gets ever faster. The final line-out is a nod towards Molly dancing, part of the MMM repertoire. Several members of MMM have been regular performers for Scally Rapper and we were especially pleased to welcome into MMM and Scally Rapper Andy Wooles ex Old Moat (1980s Manchester). 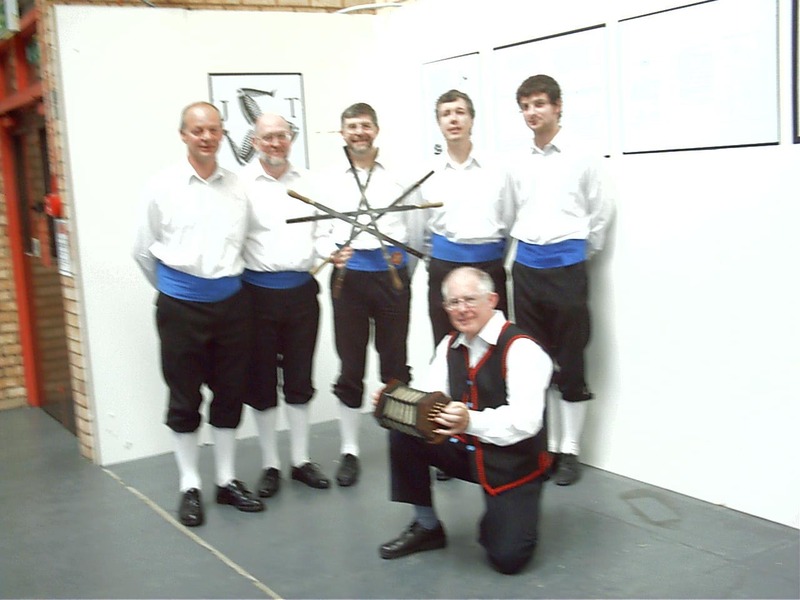 Andy was a member of the Old Moat team which won the DERT traditional dance category with Swalwell on three successive occasions starting in 1985. Andy has added extra experience and expertise to the side. MMM is now developing a second set of Rapper dancers who are ‘learning the trade’ by doing Swalwell.